This image is from the Raspberry Pi Foundation. Source. After much work from the Screenly development team, we are very proud to announce that Screenly Pro is now compatible with the Raspberry Pi Model 3 B+. Prior to this announcement, Screenly Pro was only optimized for the Raspberry Pi 3 Model B, and it could not take advantage of the more powerful features of the Raspberry Pi’s latest model. Today, our users can experience digital signage with the power of the leading Raspberry Pi hardware. The Raspberry Pi 3 Model B+ is a big improvement to the previous generation in a few key ways. First, the Raspberry Pi 3 Model B+ has native support for 5 GHz WiFi. This is an upgrade from the Raspberry Pi 3 Model B, which only supported 2.4 GHz WiFi. While 2.4 Ghz WiFi is commonly found in homes and smaller businesses, 5 Ghz WiFi is becoming increasingly common since it offers not only improved performance, but also works a lot better in “noisy” public spaces such as conference halls, event centers, hotels and larger retail environments. 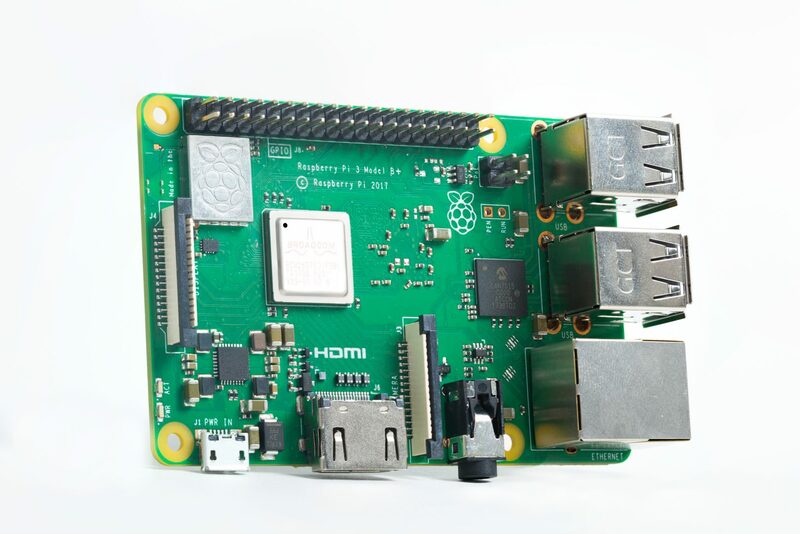 Previously, a USB WiFi adapter was needed, but with native 5 GHz WiFi support, the Raspberry Pi 3 Model B+ now provides a seamless, high-speed wireless experience for digital signs. While the native 5 GHz WiFi of the 3 B+ is useful for many digital signage deployments, we still recommend a wired connection for businesses or organizations where digital signage is mission critical. Second, the Raspberry Pi 3 Model B+ boasts an improved Ethernet adapter. Recorded LAN download speeds on the 3 B+ reach up to 11.6 MB/sec, which is a huge step up from the LAN download speed of the 3 B at 3.45 MB/sec. Third, the Raspberry Pi 3 Model B+ outperforms its predecessor in processing power. While both units use a Broadcom SoC processor, the Raspberry Pi 3 Model B+ can reach a CPU max MHz of 1400, which is an important improvement from the Raspberry Pi 3 B’s CPU max MHz of 1200. Additionally, the processor is contained within a metal casing on the Raspberry Pi 3 Model B+. This casing helps the processor better dissipate heat and continue with optimal performance even under heavy, sustained processing. The Raspberry Pi 3 Model B+ is also prepared for Power-over-Ethernet (PoE) using the new PoE HAT. While there have been reports of issues with the first batches of the PoE HAT, we still think that PoE pairs very well with digital signage, as it can significantly simply deployments as we have outlined in a previous blog post. For those of you who will upgrade to the Raspberry Pi 3 Model B+, we are excited to provide Screenly Pro compatibility with this new and improved hardware. To get started with your 3 B+ powered digital signage, you need the latest Screenly Pro disk image. You can find this under ‘Add Screen’ in your management portal Please note that there is no separate disk image. Going forward, the Raspberry Pi 3 Model B and Raspberry Pi 3 Model B+ will share the same disk image. Do let us know your experiences with digital signage on the Raspberry Pi 3 Model B+, we’re always keen to hear from our users. As always, if you experience any issues, please reach out to the Screenly Help Center for a prompt reply. For more detailed information, please see this post.